Ocean Signal’s new high-performance SOTDMA ATB1 AIS transponder has received Type Approval for distribution throughout Europe, with FCC authorisation* anticipated by early 2019, offering boat owners around the world access to one of the most advanced Class B solutions for increased visibility and navigational safety. The certification declares that the ATB1 complies with the essential requirements of the European Radio Equipment Directive, in accordance with Article 3 of Directive 2014/53/EU, based on the applicable Technical Standards and Specifications. Incorporating the superior SOTDMA (Self-Organising Time Division Multiple Access) technology and 5W output power, the Ocean Signal ATB1 Class B device enables more leisure users to benefit from a system that was originally confined to Class A commercial use. The benefits of the SOTDMA scheme include increased priority for position reports with no loss or delay of transmission, enhancing the user’s ability to be seen by other vessels in busy waters and avoid collision day or night whatever the conditions. A high-strength, affordable solution developed to suit a range of vessels, the Ocean Signal ATB1 has a faster reporting rate and higher output power than standard CSTDMA (Carrier Sense TDMA) Class B units, sending AIS transmissions every five seconds instead of the CSTDMA two transmissions per minute. The unit’s 5W output power, compared to the standard 2W, allows the transmissions to reach further. Communication and safety at sea specialist Ocean Signal’s advanced proven technology ensures the ATB1’s AIS transmissions provide the most accurate representation of the vessel’s position at all times. With 99 acquisition channels and 33 tracking channels, the powerful internal multi-GPS receiver continuously updates vessel information, including position, speed, course and heading, for accurate global positioning. Other vessel information such as identity, call sign, type and dimensions, and MMSI is uploaded to the ATB1 via WiFi directly from Ocean Signal’s user-friendly mobile app or website to be stored for automatic transmission. The ATB1 also receives and interprets AIS messages from other AIS-equipped vessels within range, which can then be relayed to other navigation devices such as chart plotters, laptops or mobiles using the ATB1’s NMEA 0183, NMEA 2000, USB or Wi-Fi outputs. Providing assurance that the ATB1 is functioning with continuous AIS transmission and optimal performance, a multi-colour LED indicator light on the ATB1 signals the on-going operational status of the unit. The new Class B AIS unit is compatible with Ocean Signal’s award-winning rescueME MOB1 man overboard AIS/DSC device, providing immediate notification in the event that a MOB1 should be activated. The ATB1 Class B AIS Transponder is included in Ocean Signal’s comprehensive portfolio of essential sea-safety equipment developed and manufactured in the UK for the maritime market. It adds to the new Ocean Signal ATA100 Class A AIS Transponder, a combined SOLAS and Inland approved solution for superyachts and commercial vessels. The Ocean Signal ATB1 Class B transponder is priced at £649 +VAT. 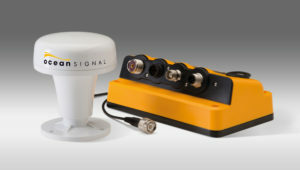 For further information about Ocean Signal’s products, visit Stand 03.131 at METSTRADE or go to www.oceansignal.com. * The following statement is for US customers only: This device has not been authorized as required by the rules of the Federal Communications Commission. This device is not, and may not be, offered for sale or lease, or sold or leased, until authorization is obtained.